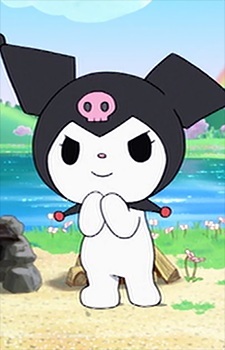 A bizarre replica of My Melody, Kuromi is her rival. She is also a rabbit and wears a black joker's hat with a pink skull at the center of her forehead. The skull's facial expression changes to match Kuromi's mood. Wielding a magical artifact called the Melody Key, which is infused with dark dream-corrupting powers, Kuromi is trying to collect 100 Black Notes in order to resurrect the Spirit of Dark Power, in the hopes that it will destroy her enemies, especially My Melody. Her tail is a weak point wherein she would fall unconscious if someone were to step on it. She is an escaped prisoner from Mari Land. It was later revealed that Kuromi committed crimes like stealing bread in order to feed Baku's poor family. When Kuromi was on trial, Baku tried to convince the judge that he too was responsible. But Kuromi claimed that Baku was lying, so that her friend wouldn't share a similar fate. What started her grudge towards My Melo was an incident where My Melo unknowingly tore a page from her journal to wipe Piano the sheep's nose. Since then, Kuromi has been writing down on it all the mishaps and unfavorable moments that My Melo has caused her (accidentally). More than 3,000 events written (6342 exactly at the start of the series), Kuromi sometimes reads them in front of My Melo, but My Melo seems oblivious to why Kuromi's so upset over them. Kuromi is the leader of a biker gang known as "Kuromi's 5." Other members include a purple cat named Nyanmi, a pale orange dog named Wanmi, a white fox named Konmi, and a grey and white rat named Chumi. They all wear black and drive around in a menacing fashion. Just like Uta, Kuromi has affections for Hiiragi. Her affections for him seem somewhat stronger than Uta's however. In one episode, Kuromi used the power of the Melody Key to turn herself into a human being so she could dance with him, taking the pseudonym Kurumi Nui. Hiiragi actually seemed to be very attracted to Kurumi Nui, but, unfortunately, the spell had a Cinderella-esque effect: if Kuromi did not return to the spell-casting circle before all the magical candles blew out, she'd be turned into a tapir like Baku. Because of this, she had to run away in the middle of dancing with Hiiragi, but he kissed her hand in farewell. In the show's opening theme prior to this episode, Kuromi is seen in the rain under a blue umbrella (Uta is usually in this part). Besides being desperate, Kuromi also has a bit of a good side. On Christmas Eve, she first refused to accept the gift her parent's gave because she was still displeased on why nobody, not even them, came to visit when she was imprisoned. But with it include a letter telling that her parents still cherished her and that they even tried to come inside the dungeon but weren't permitted. Deeply touched by this, Kuromi accepted the present. She then returned to Uta whom she ignored to help earlier. Combined with My Melo's magic with some from Santa Claus, Kuromi helped summoned the spirit of Uta's deceased mother (how this person died isn't known).